Everything you see here are gone, I sent them away to my friends. As mentioned in my last Finished Fortnight (link), I have been doing some Spring Cleaning before the Lunar/Chinese New Year. This post is merely a photo galore of products I have Given Away, that is, basically, things I cannot or do not want to use anymore. Some are brand new, some are used. Enlarge for bigger images. I will supplement a little bit info or reason why I no longer keep these. If you'd like to know more, just drop a comment below, I'll reply you shortly. 1/ I do not use talc or baby powder on my body. For face, I have too much loose powder to go through. 2/ 3/ I have too many shower gels and these two scents I don't particularly love. 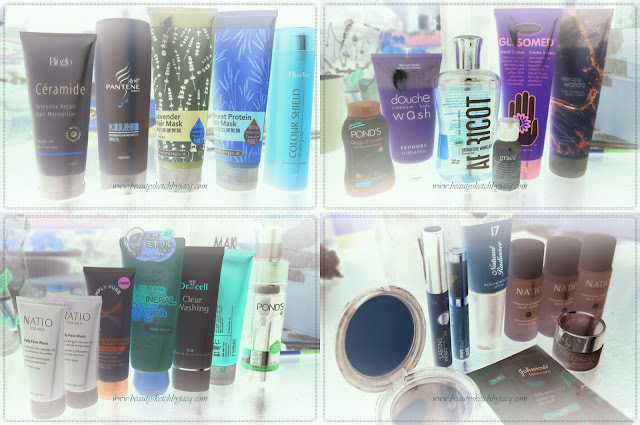 4/ 5/ 6/ Hand and body moisturisers I have plenty, these scents or formulae aren't my faves. 7/ Found another back up of this hair mask which I adore, but used up a few (empties post), I'm bored. 8/ 9/ Got many tubes of these free with ordering magazines (haul post), they're good but I don't love. 15/ 16/ 17/ 18/ I wish I could give all these face washes some good uses but I just bought and acquired too many, I even have to give away my Naruko, can you see how desperate and determined I am? 20/ 21/ 22/ Face and body bar soaps that I will never use. 27/ Bubble bath is something I should take more often given the stash I have collected. This is the most convenient bottle I can give away. 29/ Rose body lotion I don't like the scent of. 30/ Another foot spray no one has ever used. 31/ Body spray back-up of something I will probably never finish. 32/ I don't use leave-in conditioner for my hair. 33/ 34/ 35/ Found more conditioners, hair masks. 36/ None in my family has coloured hair at the moment, so no need for this shampoo. 37/ A powder foundation that is drying. 41/ 42/ 43/ More free toners to give away. 48/ 49/ I have too many base makeup, over. OMG!!! you gave away so much stuff! must feel so good after all those purging :) purging is the detox for our minds i think XD! !